The distance from the side of adaptor to the edge of a Raspberry Pi's PCB is 35mm, i.e. how far it sticks out from the PCB! Some very wide HDMI cables may protrude sideways more than the adaptor though it would have to be more than 22mm wide to do so, and none of our cable connectors do so. 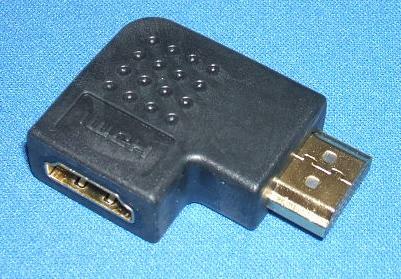 When plugged into a Raspberry Pi 1, B+ or Pi 2 the HDMI cable goes in the opposite direction as the Network & USB cables. Price: £7.00 no VAT to pay!